Casa Miradouro was built around 1890 for a family of army officers. The name, Miradouro, translates to 'Viewpoint house', because of the fantastic view towards the Atlantic Ocean and over Sintra up to the Pena Palace and the Moorish Castle. Located within 500 metres of the national palace it provides an excellent base to visit the historic monuments of Sintra as well as it's beautiful parks and the outstanding new museum of contemporary art. Beautiful sandy beaches and the spectacular Cabo da Roca (the most westerly point in Europe) are nearby. On a range of 15 kms there are numerous renowned golf courses. The railway station is a 15 minutes walk. From there trains leave every 15 minutes to the centre of Lisbon, (30 kms away). 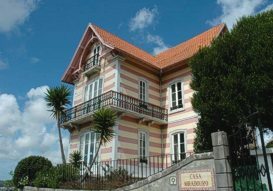 From this house you can spend an evening in Lisbon yet stay overnight in the peace and quiet of Sintra, with its clean air, and forget about the problems of Lisbon's traffic. 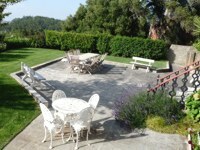 The sophisticated holiday resorts of Cascais and Estoril are 15 kms to the south. Here it is possible to visit the Casino, bars, night-clubs and restaurants, or stroll on the promenade along the coast. Many people prefer to remain in Sintra itself. In summer the temperatures are never as high as in Lisbon or Cascais, due to the altitude and exposure to the afternoon Portuguese trade wind. This makes living here very agreeable, and the reason the Kings chose Sintra as their summer residence. 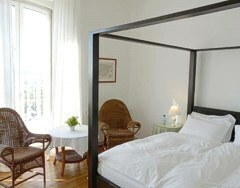 The house has eight large bedrooms with private bathrooms. They all have balcony, double glazed windows, central heating, wireless internet and hair dryer. A buffet breakfast is served in the breakfast room and snacks and drinks are available during the day. Casa Miradouro offers their guests a living room with a beautiful stucco ceiling, satellite television, a bar and a fireplace to sit around and read the literature on Sintra and Portugal that is available to you. 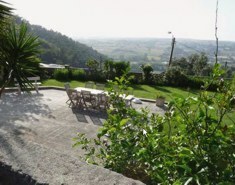 There is a very pleasant terrace area in the lovely garden that surrounds the house.